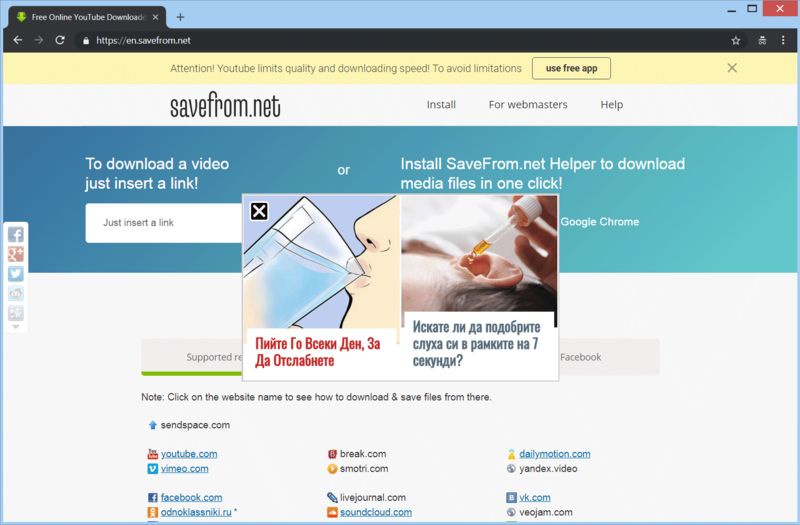 Savefrom.net is a website that promotes the SaveFrom.net helper application compatible with widely-used browsers. The application is designed to download videos directly from Youtube, Vimeo, and similar pages. It is can be indeed useful to many users who wish to watch their favorite videos at any time. However, the developers of the program have chosen to use OpenCandy – an advertising network that may have a reputation because of its third party applications module. As you probably suspect, the reason for the collaboration between any developers and OpenCandy is monetary. Continue reading to learn more. Short Description The application provides useful services but may have dubious third party affiliates policy. Symptoms The user’s homepage can be changed, multiple files and registry entries can be added to the system. Distribution Method Bundling, its official page, other freeware pages. User Experience Join Our Forum to Discuss SaveFrom.net Helper. In reality however, the program shows different types of advertisements and may slow down your PC, plus it may redirect you to dangerous sites which may be either scam- or malware-infested. As you can see there are even pop-ups appearing on the site itself, even before trying to download the helper application. The ads seem to detect your country or general region and display ads in your language in order to reel you in deeper. Be careful around that site and everything connected to the applications. You can read more about them inside this article. Computers, affected with SaveFrom have decreased in number, but the app itself has been developed to display new forms of advertisements. In addition to this, multiple different changes have been made to the website of this unwanted application and a Facebook page of it has also been created. →OpenCandy is an advertising software module consisting of a Microsoft Windows library that can be incorporated in a Windows Installer. When a user installs an application that includes the OpenCandy library, it presents offers for additional third party applications that may be unwanted by the user. Such third party applications are typically installed onto users’ computers by default, but may include an option to ‘opt-out’ during or after the installation process. Is SaveFrom.net Safe to Use? Due to the application’s appealing description, many users have decided to download it. Some users may have chosen to use it continuously while others have opted to uninstall it. →In April 2014, SaveFrom.net, a video-download browser extension, issued a mandatory update. (If you refuse the update, the helper is disabled within your browser). That update seeks far more permissions to track your Internet browsing activities, including the sites you visit even when you are not using the video-download app. (To urge use of their browser helper, the use of their web-site to download without an app is restricted). No one is really surprised by the fact that third party companies in various sectors work together for profit reasons. In the field of unwanted software and bundling, developers and advertisers tend to collaborate quite often. Data obtained from the software users is often sold to online advertising agencies to display targeted advertisements. Should I Remove SaveFrom.net from My PC? Even though you may find the application handy and user-friendly, you may want to consider uninstalling it. 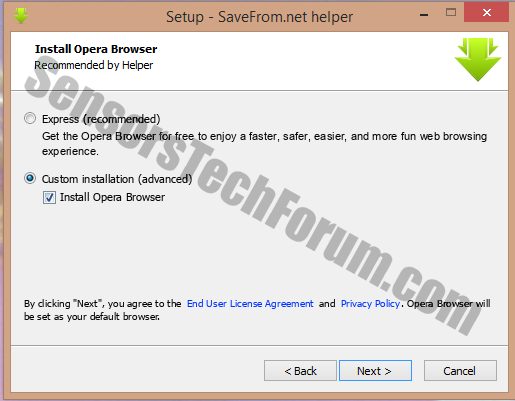 When we downloaded it, the installer had the Opera browser as a recommended option. However, a PUP could have been in its place. Since SaveFrom.net Helper may have been accompanied by a troublesome PUP or PUPs (potentially unwanted programs), running a full system scan to clean the system is often advisory. If you are an expert user, you can refer to the removal steps below the article. Threats such as SaveFrom.net Helper may be persistent. They tend to re-appear if not fully deleted. A malware removal tool like Combo Cleaner will help you to remove malicious programs, saving you the time and the struggle of tracking down numerous malicious files. Threats such as SaveFrom.net Helper may be persistent on your system. They tend to re-appear if not fully deleted. A malware removal tool like SpyHunter will help you to remove malicious programs, saving you the time and the struggle of tracking down numerous malicious files. Note! Your computer system may be affected by SaveFrom.net Helper and other threats. SpyHunter is a powerful malware removal tool designed to help users with in-depth system security analysis, detection and removal of threats such as SaveFrom.net Helper. 1. Install SpyHunter to scan for SaveFrom.net Helper and remove them. 2. Scan with SpyHunter, Detect and Remove SaveFrom.net Helper. Ransomware infections and SaveFrom.net Helper aim to encrypt your files using an encryption algorithm which may be very difficult to decrypt. This is why we have suggested several alternative methods that may help you go around direct decryption and try to restore your files. Bear in mind that these methods may not be 100% effective but may also help you a little or a lot in different situations. Note! Your computer system may be affected by SaveFrom.net Helper or other threats. Remove SaveFrom.net Helper by cleaning your Browser and Registry. Fix registry entries created by SaveFrom.net Helper on your PC. Combo Cleaner is a powerful malware removal tool designed to help users with in-depth system security analysis, detection and removal of threats such as SaveFrom.net Helper. Step 5: In the Applications menu, look for any suspicious app or an app with a name, similar or identical to SaveFrom.net Helper. If you find it, right-click on the app and select “Move to Trash”. Step 6: Select Accounts, after which click on the Login Items preference. Your Mac will then show you a list of items that start automatically when you log in. Look for any suspicious apps identical or similar to SaveFrom.net Helper. Check the app you want to stop from running automatically and then select on the Minus (“–“) icon to hide it. Remove SaveFrom.net Helper – related extensions from your Mac’s browsers. A pop-up window will appear asking for confirmation to uninstall the extension. Select ‘Uninstall’ again, and the SaveFrom.net Helper will be removed. When you are facing problems on your Mac as a result of unwanted scripts and programs such as SaveFrom.net Helper, the recommended way of eliminating the threat is by using an anti-malware program. Combo Cleaner offers advanced security features along with other modules that will improve your Mac’s security and protect it in the future. 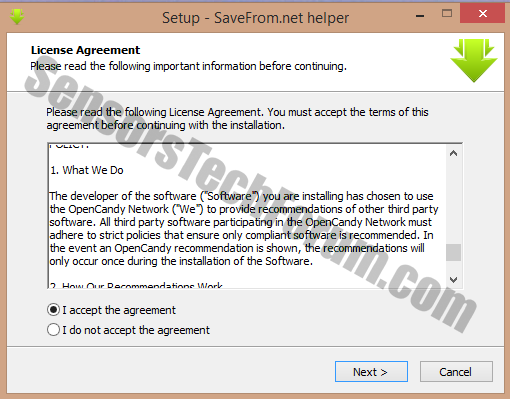 Hey !, I found this information for you: "Remove SaveFrom.net Helper. Uninstall PUA.OpenCandy". Here is the website link: https://sensorstechforum.com/remove-savefrom-net-helper-uninstall-pua-opencandy/. Thank you.